Flowers on the clothes and accessories are the fashion trend of the summer, we will actively carry into the next season. It should be noted that the floral print of the new autumn-winter season looks a little different than his old «brother». «Winter» flowers have a deeper, more saturated colors (burgundy, blood red, deep blue, pink) and become sharper and more. For example, Italian brand Dolce & Gabbana in its new collection of clothes painted on the large and bright colors in combination with the angels. The result was a floral print in the Renaissance style, which is decorated skirts, dresses, blouses, and much more, including accessories, shoes and bags. A brand Burberry Prorsum offered dresses and peplum skirts with a floral pattern of muted shades of burgundy and gold on a dark chocolate background or khaki. There are also more vibrant options. At Peter Pilotto, Temperley London, and many others you will find dresses, skirts and suits with prints as bright exotic flowers. First of all, it is worth noting a few basic rules of wearing floral print. Never wear top and bottom with the same floral pattern. So you ‘re like the girl in pajamas. The exceptions are the dress, but it is, if, in your opinion, is too bright, it might be «diluted» jacket or cardigan neutral color. Start small, with accessories, as well as get used to safely move on to things with flowers. 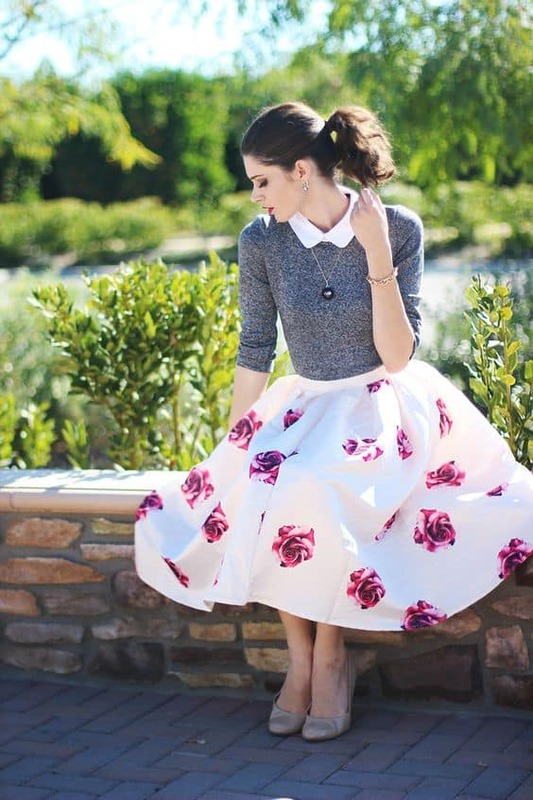 Choosing clothes with floral print, consider the features of your figure. 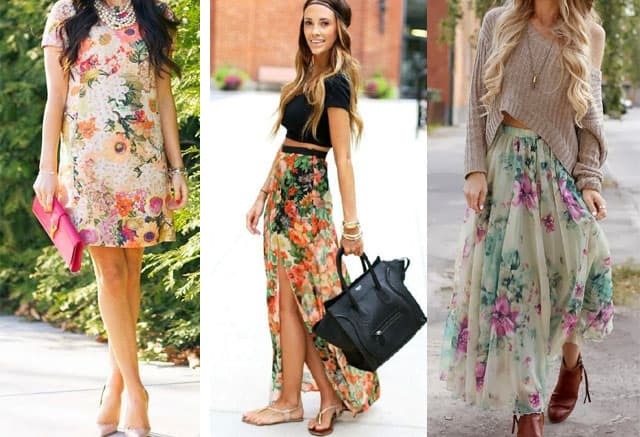 If you do not want to look like a complete, choose clothes in small or medium flower, which are slightly «scattered» on the surface of the fabric. This outfit is not exactly add to your extra kilos. And if you can boast of ideal forms, then you can afford «flowers» of any size. Floral print trend is if there are accessories supplied from the same cloth. Stylish hat, belt or feminine jewelry to help make the image complete and memorable. Clothing with floral print should ideally sit on you — never pull, pull, do not be too tight or loose. Another unwritten rule: the brighter print, the simpler style. Otherwise, they will be constantly among themselves «arguing», and you risk looking tasteless. The easiest and safest way is to combine «flower» thing with the rest of the set of neutral colors: beige, black, white. You can add one accessory with a print. Since the image will look concise and relevant. Would you like to look brighter? 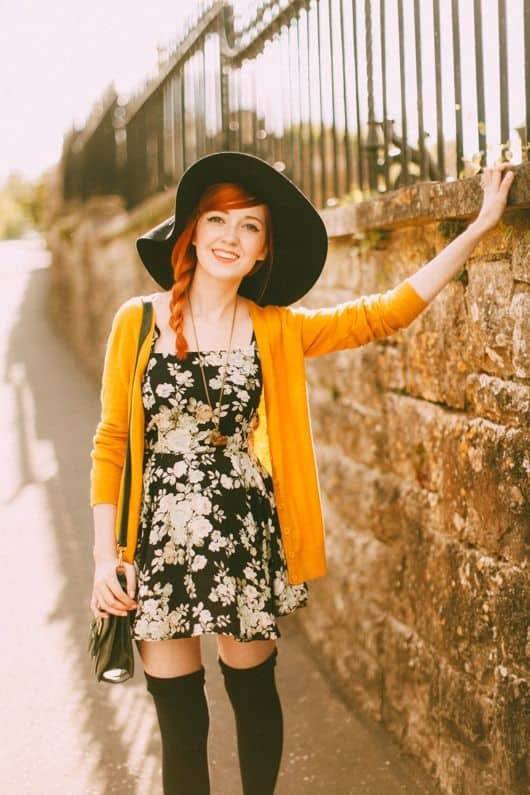 Add a trend floral clothing of bright colors. The main rule is color up to shade must be the same color in print. Another option it is to combine contrasting colors in the set. Also great combined with each other colors that are next to each other in the color spectrum (blue and blue-purple, green and yellow-green, orange and red-orange). In this case, note that the basic shade prints should contrast with the color of the rest of the set. Finally, in one package you can combine three shades of the same color close to the color spectrum (blue-green, green and yellow-green). For example, a shirt with blue and green flower fine will be combined with yellow-green skinny jeans and add the image of harmony green belt or a clutch of green. Pastel shades combined with floral print on the same principle. Floral patterns (especially small) perfectly combined with classic denim blue. And then you get the actual outfit in country style, which is also very popular. If such a combination, albeit bright, seem boring to you , try to combine floral pattern with other prints. However, in this case, there is a rule. Included should be a dominant print, otherwise the image will look congested. The combination of floral prints with other patterns occur on two principles. Either in different prints are identical at least two colors, or in one print has a color that is not in the other. If the combination of prints still seems too bright, you can always trim black cardigan, jacket or calm accessories. 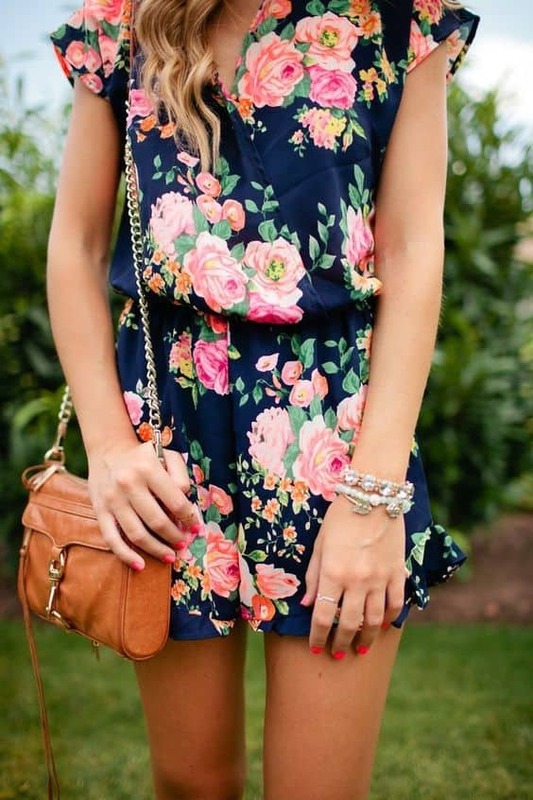 Floral printed jumpsuit and light brown purse is attire, which adjusts to the positive of its romance.